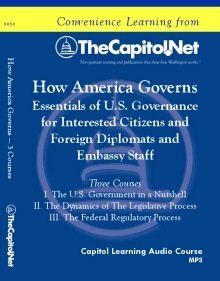 As a foreign diplomat or embassy staff member based in the United States (or as an interested citizen) you need a good understanding of the U.S. government to work effectively. This three-part series of courses introduces you to the structure of the three branches of government, the dynamics of Congress, and federal rulemaking and the federal regulatory process. SPECIAL OFFER – Includes 25 copies of the Pocket Constitution, plus FREE shipping in the US. Also see our How America Governs: U.S. Government Dynamics Training course available for custom, on-site training.